The meeting was peaceful (when "the organizers have peaceful intentions and the meeting is non-violent" according to the OSCE Guidelines on Freedom of Peaceful Assembly). The participants did not call for violence and war, did not use or provoke violence. The participants of the peaceful assembly did not violate public order, the traffic rules and did not pose a threat to public safety as well as did not violate the rights and freedoms of others with their actions. Individual conflict situations do not affect the general characteristics of the meeting and should be evaluated in terms of the individual responsibility of people. In the course of the peaceful assembly, it was not possible to identify a part of law enforcement officers as they were in civilian clothes, without identification signs. The presence of police officers at peaceful assemblies in civilian clothes does not allow participants to understand their functions and powers, and does not facilitate communication and effective resolution of complex or conflict situations. There are no obstacles in the work of independent observers and media, which is a good practice. At the same time, police officers lack a comprehensive understanding of the functions and tasks of independent observation. In addition, they do not contribute to the observation, do not provide the requested information, for example, about the number of officers and participants. This may be due to the fact that the management of the Municipal Department of Internal Affairs of the Minsk City Executive Committee does not bring to the attention of officers the information provided by the Belarusian Christian Democrats. It should be noted that according to the Guidelines, the monitoring of peaceful assemblies is an important source of independent information about the behavior of all parties of an assembly. This information can be used in various ways, including as a basis for dialogue between the authorities, law enforcement agencies and civil society. Observation reports help estimate the effectiveness of current legislation and the extent to which the state fulfills positive obligations to protect the freedom of peaceful assembly. Resolving conflict situations with participants on the part of law enforcement agencies was not always effective. The dialogue between the organizers and the authorities in preparing and holding a peaceful assembly with a large number of participants is a good practice that should be supported and encouraged. It is known from mass media reports that several participants of the assembly were arrested. After performing on stage with a speech, D. Dashkevich was detained outside the venue of the event; he was in a temporary detention center before the trial; the reason and alleged offenses are not known. N. Harachka was also detained outside the fenced area. V. Rymasheuski, one of the organizers of the event, was detained by officers in civilian clothes, taken to a police vehicle, and freed after some time without charges. The procedure for the personal search and seizure of certain personal belongings should be considered redundant and ineffective in ensuring security and public order. The lack of unified rules and requirements for portable items does not contribute to an understanding of the requirements of law enforcement officers. The facts of the prohibition of taking symbols (white-red-white flags) outside the event site were recorded. At the meeting site there were no toilets within the boundaries of the barriers, there were not enough garbage bins to maintain order. The terrain and organization did not fully comply with the principle of inclusion. 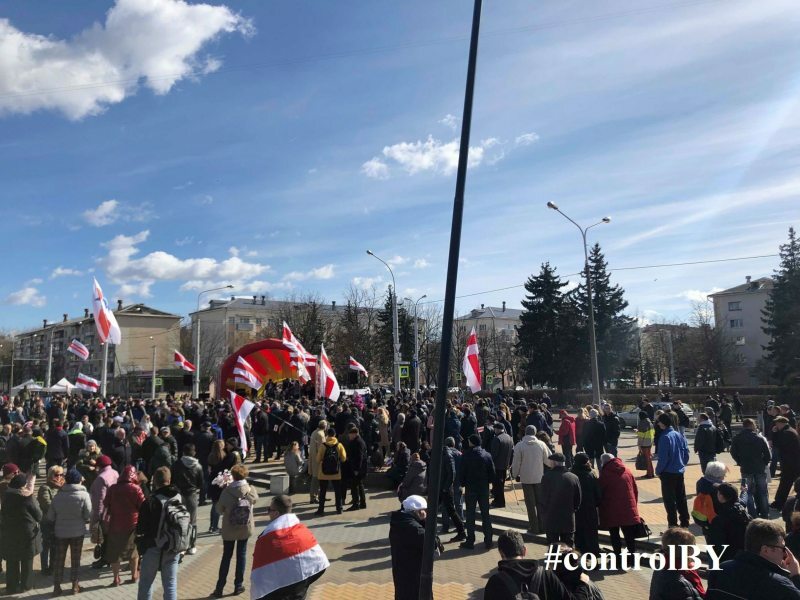 The National Human Rights Public Association "Belarusian Helsinki Committee" and the Human Rights Center "Viasna" systematically monitor every peaceful assembly in Belarus on the basis of developed methodology. It includes recruitment of observers and training them following skills: the principles of public control, international standards of peaceful assembly and monitoring methodology; filling out the monitoring questionnaire during observation; processing of the questionnaires and writing a monitoring report. The questionnaires for the monitoring of peaceful assemblies are developed in cooperation with human rights organizations. They include following points: the functions and powers of observers and journalists, the standards of organizers measures, the participants and law enforcement officials during the assembly as well as the presence of the ambulances and medical rescue teams. Observers are allowed to monitor an event only if they agree with the monitoring rules and principles (such as: to be independent and politically neutral; to contain factual information, not opinions; do not participate into observed event; to adhere to the principles of law: to reject any form of violence and discrimination; to behave correctly). During their terms as observers, people shall stay separately from the participants of the event. 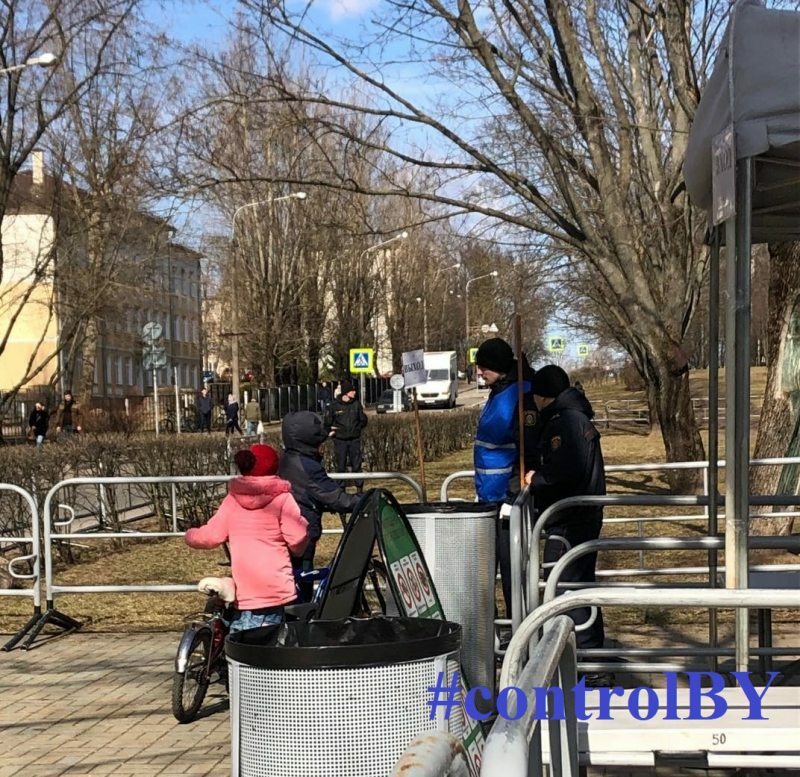 They are marked with special certificates and special blue vests with the inscription "#Controlby". On March 25, Belarus celebrates the traditional holiday “Freedom Day” in honor of the anniversary of the proclamation of the Belarusian People’s Republic. In 2017 and 2018, numerous repressions were recorded, including the detention of independent observers (https://spring96.org/en/news/86740, https://spring96.org/en/news/89625). The Internet and the media widely covered procedures for submitting applications for the festive mass events. 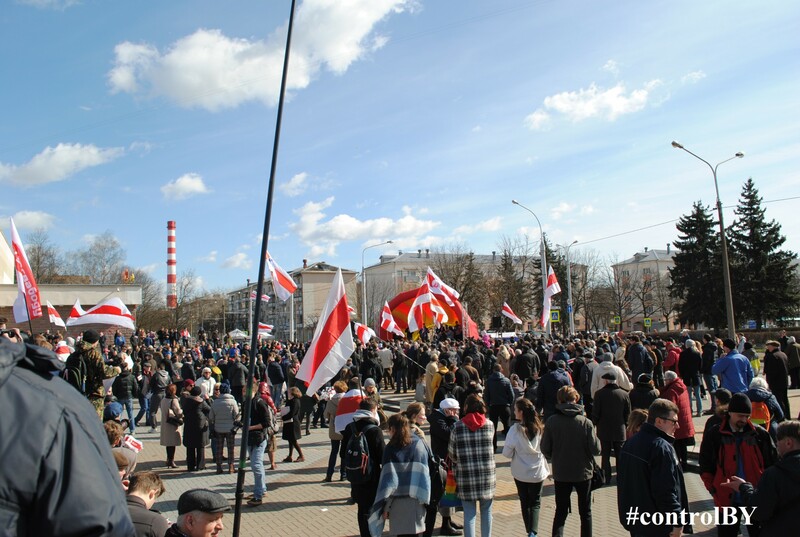 It is known about the refusals of the Minsk City Executive Committee to two groups of organizers about the celebration at the venue near the Opera Theater, at the Dynamo Stadium, in Freedom Square, at the venue near the Palace of Sports. The organizers were invited to hold events under notification procedure in permanently allocated places, one of the organizing groups agreed to the proposed option and submitted a notice to hold a concert in Kiev Park on Sunday, March 24. The organizers were invited to the Minsk City Executive Committee to discuss the details of the event on March 19, 5 days before the date of the event. According to one of the organizers, Y. Hubarevich, the meeting was attended by the leadership and representatives of ideological departments of the Minsk City Executive Committee, representatives of the Main Internal Affairs Directorate and the Prosecutor's Office. It is also known that the focus of the meeting was on security issues and government officials were particularly noted that the organizers go to the meeting by holding such meetings, since the current legislation does not oblige to negotiate details of the preparations for the events. 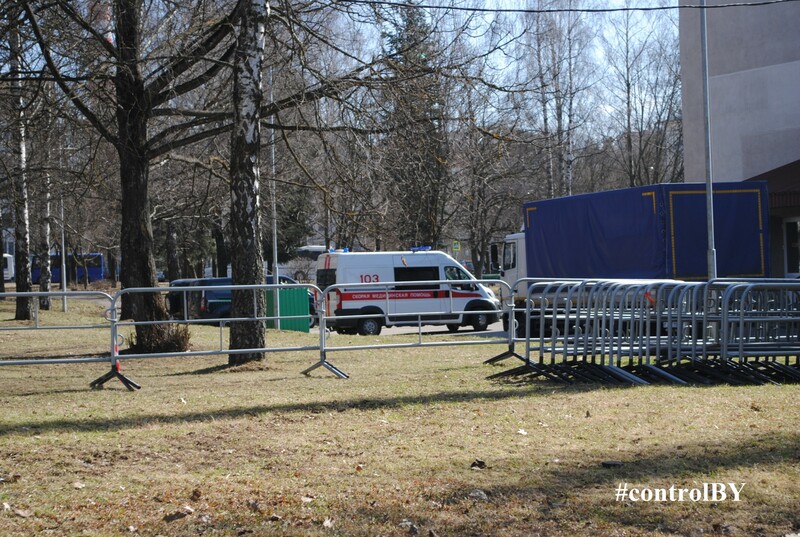 On March 20, the site in Kiev Park hosted a meeting to decide on the placement of the stage, stalls and checkpoints. It is known that the organizers actively invited people to the event (including distributing invitation leaflets in the city, through the media and social networks), crowdfunding funds called for volunteers to join the preparation and holding of the event. The organizers disseminated information on how to get to the place of the event and the plan-scheme of the area. Information on pre-emptive detentions prior to the event is not available. 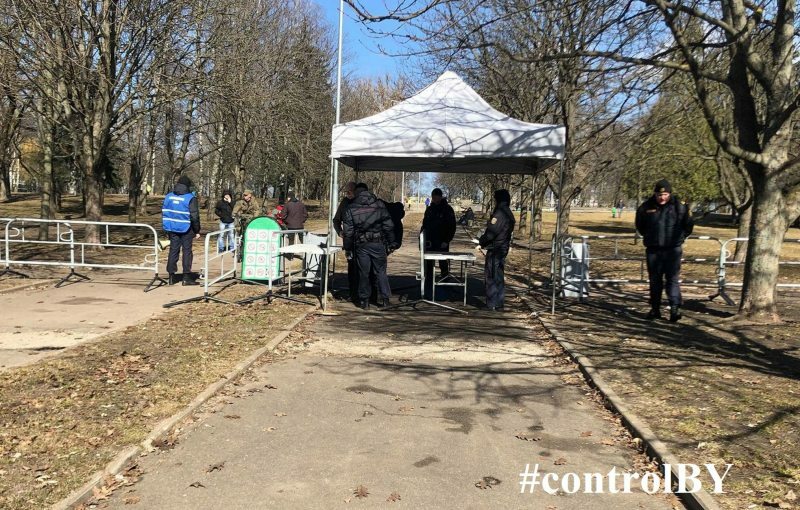 When monitoring the event in Kiev Park, the observers paid special attention to the inspection procedure at the entrance and the behavior of the officers of the law enforcement agencies in conflict situations. During the meeting, in-person and continuous civilian control was carried out by 6 observers who had been trained and were marked accordingly. Two of them represented the International Observers Network (ION). They were marked with gray vests with the inscription “Observer” and had a certificate with them. On March 21, a letter was sent by fax and e-mail to the Municipal Department of Internal Affairs of the Minsk City Executive Committee from the Belarusian Helsinki Committee informing about the intention of observers to attend the mass events on March 24 and 25 in Minsk and about the importance of independent monitoring at peaceful assemblies. The letter also contained a request to inform officers on duty at the events about the presence of observers, to ensure their safety, and also to facilitate the work by providing requested information. The beginning of the gala concert in Kiev Park was announced at 13:00, the gathering of participants from 12:00. The observers attended the venue from 12:15 to 14:20; most of the time, the observers recorded inspection procedures at checkpoints. The organizers were marked with badges, people with badges “Security” were also marked. This allowed those present to identify the organizers and be able to contact them. 3. The perimeter of the site was limited to metal portable fencing. It was possible to enter and exit the event only through inspection points. On the approaches to the site there were four inspection points representing tents without walls, equipped with tables. At each inspection point there were from 8 to 13 officers in uniform, who conducted inspections using hand-held metal detectors. The procedure also included: inspection of bags, personal belongings, and personal inspection by hand. People felt their hands on the body, asked to unbutton their outerwear, felt the hoods of their children, felt the baby carriages and examined them, the staff asked them to open the bags, and in some cases they themselves touched things in the bags. Bodies of participants were palpated, also participant were asked to unbutton their outerwear, the officers palpated the hoods of children, the baby carriages were palpated and inspected, the officers asked to open the bags, in some cases they themselves touched things in the bags. The search was followed by separation by gender. At each inspection point there was a representative of the Information Group of the Main Internal Affairs Directorate with a loudspeaker marked by a special vest and the head of the group. A camera on a tripod was installed near each checkpoint, recording all people entering the event. At each inspection point, there were from 8 to 13 officers in uniform. Near each inspection point, there was an information poster with prohibited items. Liquid in containers of less than 0.5 liters in most cases allowed to be carried, but not at all checkpoints. There was no possibility to leave personal belongings and pick up at the exit. Children and adults with bicycles were not allowed. 4. At the perimeter of the venue, there were at least 55 officers in the form of police, at least 48 employees in civilian clothes. Inside the fenced area, the officers in civilian uniform took pictures with hand-held video cameras. 5. Near the Kiev cinema there were 7 buses, 2 police cars, an ambulance car, an Emergencies Ministry car, a sapper vehicle, a blue minibus with video and sound recording equipment. 6. At about 1:30 pm, 2 officers (in uniform and civilian clothes) approached the group of observers. One of them introduced himself as Valery Kozhych, asked what the observers were doing at the event, and copied their passport data. He also explained that he was not acquainted with the information letter from the Belarusian Christian Democrats. The police officers in civilian clothes and the head of the inspection point applied to the observers with a request to influence the behavior of one of the participants in a conflict situation. 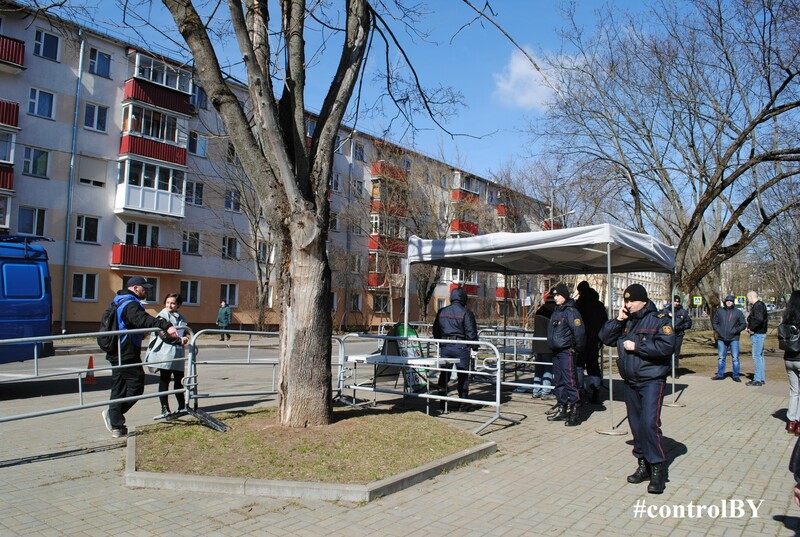 The participant demanded from the officers to communicate with her in the Belarusian language and if they refused, she called for a police squad. The participant was shooting everything on a cell phone camera. A group of activists from the movement “Mother 328” was approached by a man who behaved aggressively and in conflict. A police officer in uniform tried to settle the conflict through negotiations, but to no avail and soon withdrew. Activists of the movement independently resolved the conflict situation. 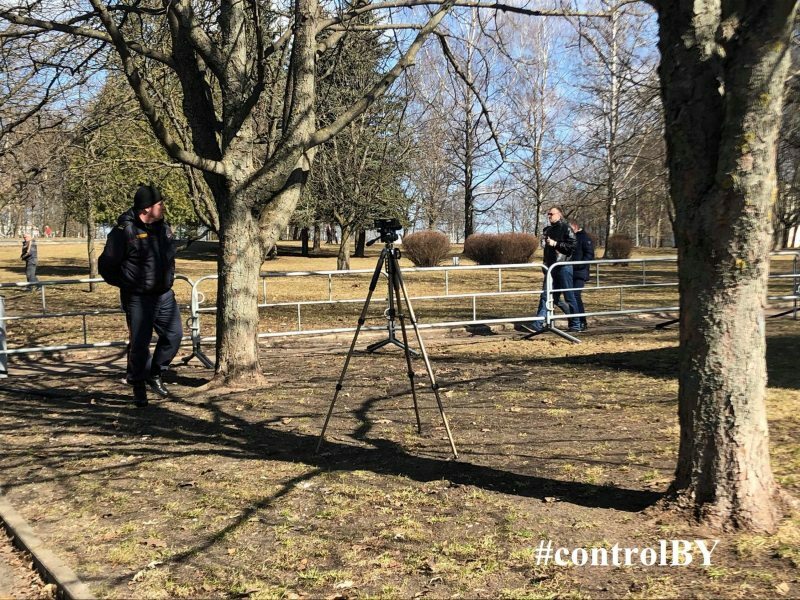 Regarding V. Rymasheuski, one of the participants behaved defiantly and aggressively, interfered with live broadcasts from the mobile phone, and spoke loudly. Officers in uniform took the participant outside the fence and did not allow him to come inside. 8. The speaker shouted “Long live Belarus! Live forever!”, read the third charter of the Belarusian People's Republic, talked a lot about the independence of Belarus, music bands performed on the stage. 9. 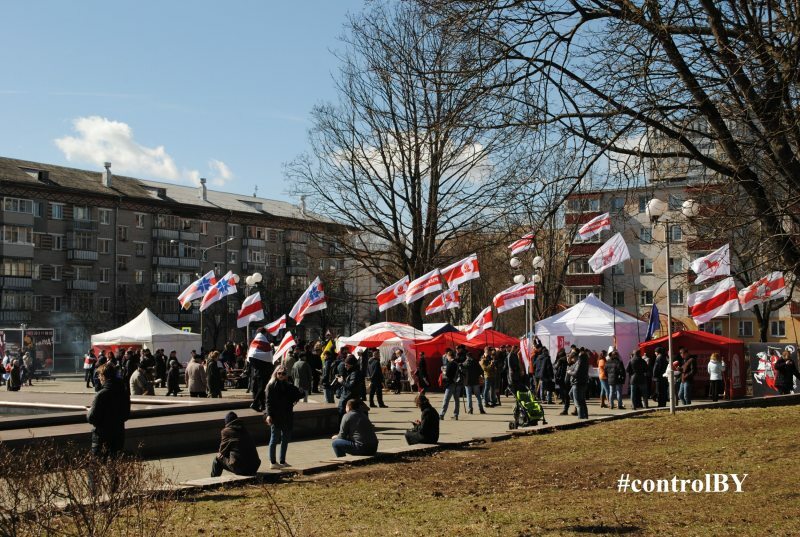 Numerous symbols and posters were used at the venue: white-red-white flags, white-red-white flags with the emblem “Pahonia”, a Gadsden flag, flags of the Young Front, Belarusian Christian Democrats, United Civil Party, Movement for Freedom, Belarusian Social Democratic Party, EU, Ukraine, and a white-green-white flag. There was a banner with the emblem “Pahonia” for photographing, a stretch “For Independent Belarus”, a man in a T-shirt with the inscription “Stop the genocide of youth under art. 328”, a poster with the portrait of Mikhail Zhamchuzhny and the inscription “Freedom to Mikhail Zhamchuzhny”, a poster with the portrait of Sviataslau Baranovich and the inscription “Freedom to Sviataslau Baranovich”, as well as balloons. Also, there were posters “Belarus has become a country not for life, but for survival. SOS” and "Belarus Repressed Fines Grates Torture". 10. The representatives of mass media actively worked at the event: they communicated with the participants of the assembly, filmed what was happening on photo and video cameras, took interviews. The participants communicated with the media. 11. The total number of people present at a peaceful assembly is difficult to estimate. Based on a photograph taken from above and placed on social networks, at least 1,400 people were present at the site at one time. The information group found it difficult to tell the number of participants and law enforcement officers. They also reported that they did not provide such information. From the point of view of the protection of public order, law enforcement agencies need to know the number of participants and act proportionally. 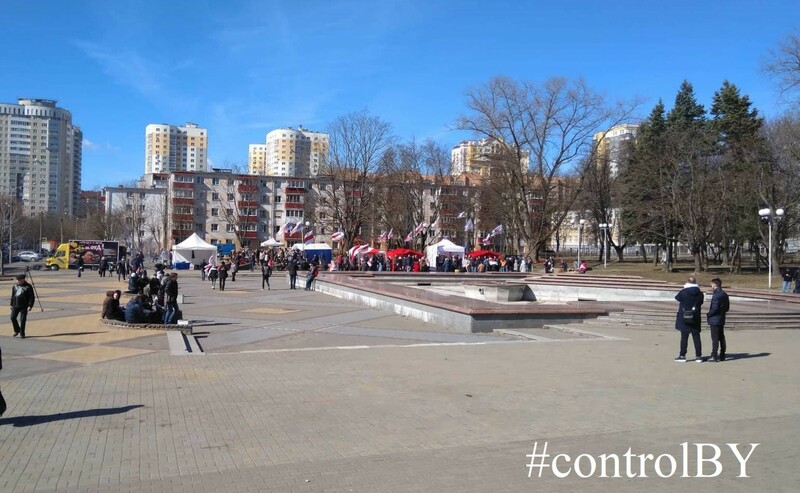 According to the police department of the Minsk City Executive Committee, the maximum number of participants has not exceeded one and a half thousand people. 12. At 14:20, the observation was over, according to the media and the Main Internal Affairs Directorate of the Minsk City Executive Committee, the meeting lasted until 18:30.
organize a luggage room for things that are forbidden to be taken to a peaceful assembly. not charge for their services when people exercise the right to peaceful assembly and the right to express opinions. do not charge for your services when people exercise the right to peaceful assembly and the right to express opinions.